After completing a flip-flop through-hike of the Appalachian Trail in 2016, I can confirm that much of the trail is indeed a “green tunnel” and somewhat lacking in epic views. From Virginia until Vermont, it’s common for hikers to become bored and frustrated by the plethora of rocks and roots and trees and infrequent viewpoints. 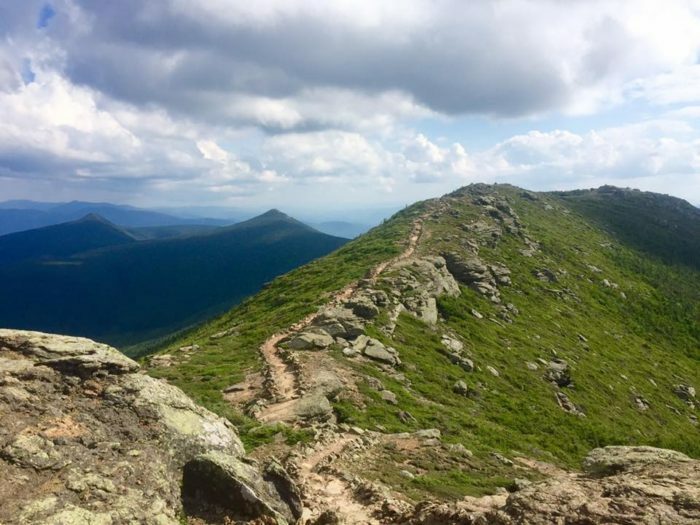 That is, however, until you reach the most incredible spot (in my opinion) on the entire Appalachian Trail: Franconia Ridge in the White Mountains. It’s a place so magically beautiful that hiking it is a spiritual experience. The White Mountains of New Hampshire are a sight to behold and a walk to remember. I will never forget the mind-blowing — even spiritual — experience I had when walking the 2.5-mile crest of the Franconia Ridge. I wracked my brain trying to remember the names of the supporters who had asked me to do a mountaintop intention-setting for them, but no one in particular was coming to mind. I shrugged and forget about it as I huffed and puffed uphill. But then, when I finally reached the alpine zone and emerged out onto the infamous Franconia Ridge with its mind-bending 360-degree views, my mouth dropped open. I knew that this ridge walk up and over four mountains — Mt. Liberty (4,459 ft), Little Haystack (4,780 ft), Mt. Lincoln (5,089 ft) and Mt. Lafayette (5,260 ft) — deserved to be prayed upon. The views were so grand that I wanted to set intentions for more than just individual people, but I didn’t know what to pray for. So, I cleared my mind and invited a higher power to inspire my thoughts. 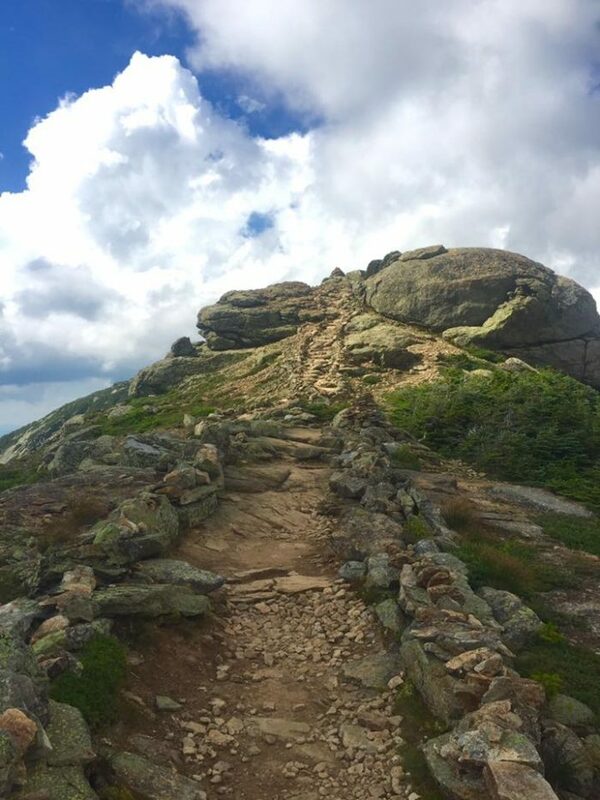 As I hiked, slowly and methodically heading up the rocky trail towards Little Haystack Mountain, I noticed that my feet were beginning to feel tired. I had just resupplied the day before, and my pack was heavy with food. I could have fixated on the dull ache in my feet, wishing that the pain would go away. But I knew that this was an opportunity for prayer. As I continued to walk, the conditions became more challenging. The sun was beating down on me, and I could feel it starting to burn my skin. Simultaneously, the wind on the exposed ridge was growing more intense. I felt the instinct rise in me to foster resentment for these unpleasant conditions. Again, however, I decided to turn these challenges into intention-setting opportunities. I looked up at the searing sun and began to chant an intention for people who are in the spotlight who don’t want to be. I saw and felt the power of the wind sweeping over the gorgeous, mountainous landscape — stretching in front of me as far as the eye could see — and I said a prayer for those who have been blown off course and who are yearning to find their way again. 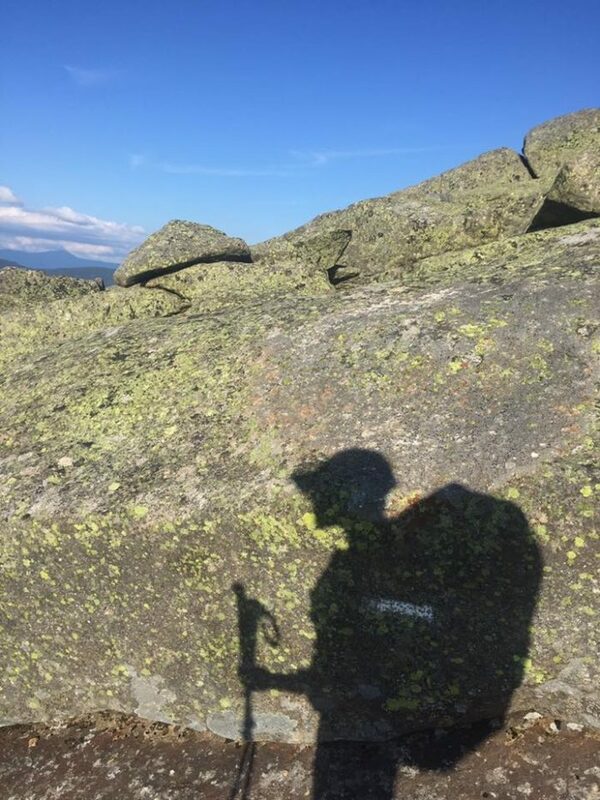 Finally, after what felt like hours, I found myself climbing the final and highest peak in the Franconia Range — Mount Lafayette. When I at last reached the summit, the view of the surrounding mountains and lush valleys was so incredible that tears sprung from my eyes. I began to dance and sing with joy, almost involuntarily. I dedicate this walk to all those facing trials and tribulations, but who are choosing to dance and sing and celebrate anyway. Because life is worth celebrating, even when it’s hard. I dedicate this walk to all those facing trials and tribulations, but who are choosing to dance and sing and celebrate anyway. As this final intention washed over my body and radiated out into the land and sky around me, I opened my eyes and gasped. Thanks to the powerful, prayerful two hours I had just experienced atop Franconia Ridge, I felt more connected to the whole of humanity than I had ever felt before. I shook my head with wonder, a blissful smile on my face, and thought, And so it is that all of the sorrows and all of the joys of the world are held by all of us. BELOW: Watch this video clip from my AT vlog to see me recount this story not long after it happened. Subscribe to my YouTube channel, Instagram or blog to follow my 2018 PCT fundraiser hike for girls’ empowerment nonprofits. Thank you! WONDERFUL and inspiring description of your experience! Hiking is a very spiritual experience for me as well, and I find myself silently talking with God and thanking him for everything (the world he created, the trees, the rocks, the wind, the sun, my health, my strength, my equipment, my freedom to hike). Hiking is my church, my gym, my therapeutic counseling session. Thank you for writing this. Thanks Steve! Hiking feels like my church, as well! I appreciate your comment. So in other words, you don’t want to pay for your own hike. You’ll take other people’s money for your adventure all the while virtue signaling that you’re some rare humanitarian. If you really wanted support some non profits you could get a job, save money and donate. It’s less glamorous but highly effective. Just another sanctimonious freeloader. Sadly the trails are cram packed with your kind. If I was raising money for myself to hike, I would be extremely transparent about it as I was in 2016 when I crowdfunded my AT hike. There is no reason to lie about fundraising intentions! In 2018, to give back and thank my wider community for helping me achieve the AT hike, I will be donating 100% of all funds raised to three nonprofits that I have chosen. It will be extremely obvious that I am not skimming anything off the top for myself. The fundraising website will say “x amount raised,” and I will split that into thirds and redistribute to the nonprofits, and they will publish the amount received…and you can do the math. Raising funds and awareness for a cause while doing a hike that I’m going to do anyway is a way for me to feel connected to a higher, community-oriented purpose while also achieving a personal goal.